Temple is offering free MMR vaccines after a mumps outbreak has sickened more than 100 people. 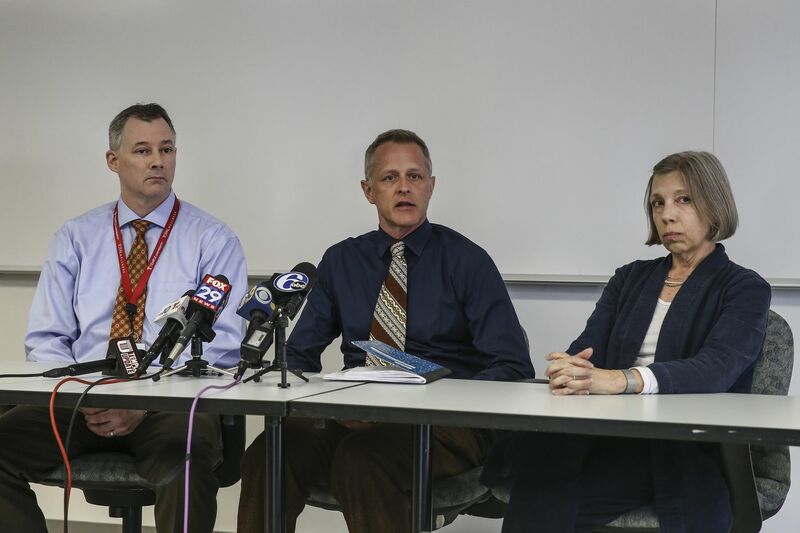 Speaking at a press conference Tuesday, from left: Temple's Mark Denys, Director of Student and Employee Health, Steven Alles Director of Disease Control, Philadelphia Department of Health and Susan Coffin, Medical Director with the city health department. Temple University officials announced Tuesday that they are prepared to vaccinate up to 1,800 students and staff at a free clinic to address the mumps outbreak that has sickened 105 people over the last two months. The walk-in clinic will be held on Wednesday and Friday from 9 a.m. to 4 p.m. in Temple’s Mitten Hall Great Court. All Temple students, faculty, and staff can get a dose of the measles, mumps, and rubella (MMR) vaccine at no charge. “Hopefully, the numbers go down as we vaccinate more and more people,” Mark Denys, director of Temple’s student and employee health services, said at a news conference. Mumps is a contagious viral disease. Common symptoms include swollen salivary glands, fever, headache, muscle aches, and loss of appetite. Although serious complications are rare, especially in people who were vaccinated as children, mumps can cause inflammation of the brain, deafness, or sterility. It’s typically spread through direct contact with saliva or respiratory droplets, which often happens by sharing food and drink or living in close quarters — making college campuses particularly vulnerable. The outbreak at Temple was first reported in late February, just before the school’s spring break. Although city health officials said they’ve most likely identified “Patient Zero” — the person who started the outbreak — they did not provide any details about the person’s vaccination status. Steven Alles, director of disease control for the Philadelphia Department of Public Health, said the original case related to an individual traveling somewhere outside of Philadelphia. As of Tuesday, the Philadelphia health department reported 18 confirmed cases of mumps and 87 probable cases. Most are at Temple, but a handful are in surrounding counties. West Chester University and Drexel University have also reported one case each. All the cases have been linked to Temple, Alles said. None of those infected have been hospitalized. Although most of the people with symptoms had been vaccinated as children, Alles said, the mumps vaccine loses its effectiveness over time. A booster dose can help prevent infection or decrease the severity of symptoms for those who do get sick. In the early weeks of the outbreak, Temple officials focused on isolating infected individuals and getting booster shots to people in close contact with them. Between the school’s health services and nearby pharmacies, Denys estimated, about 1,000 booster doses have already been delivered. But as the outbreak continued to grow — about five additional cases are reported each day, Denys said — school officials decided opening a vaccine clinic was necessary. “The incubation period of mumps is relatively long,” Alles said. Students can be contagious for 12 to 25 days. “Many can spread it before they even know they’re sick." The clinic will offer two doses of the MMR vaccine to anyone who hasn’t had it before, or a third booster dose for those who are already vaccinated with the usual two doses, but are now in close contact with an infected person. Standard recommendations from the U.S. Centers for Disease Control and Prevention are for children to get two doses of the MMR vaccine: the first at 12 to 15 months old and the second at 4 to 6 years old. The vaccine is 88 percent effective after two doses. Although mumps cases in the United States have declined by 99 percent since the vaccine was introduced in 1967, there’s been a resurgence in recent years driven by college students. In 2016, outbreaks at universities in Iowa and Illinois affected several hundred students. In 2017, Pennsylvania State University had an outbreak of more than 40 cases. Researchers at Harvard University have suggested requiring mumps booster shots might help protect students as they enter college. As of now, the CDC recommends a third dose only during an outbreak such as the one at Temple. Since the outbreak, Temple announced a new policy that will require all incoming freshmen to be up to date on the MMR vaccination series, as well as the chicken pox and tetanus, diphtheria, and pertussis (whooping cough) vaccines. Previously, the university did not require immunizations for admitted or enrolled students. Although some students have petitioned Temple to temporarily close, the university is not considering it because health officials say closing wouldn’t help control the outbreak. For anyone who is already experiencing symptoms, Alles said, the best plan of action is to stay home and rest. Limiting contact with others will help prevent the spread of the disease.